In the May update of Power BI desktop, we are excited to see the release of the new Power BI connector for the Common Data Service for Apps. 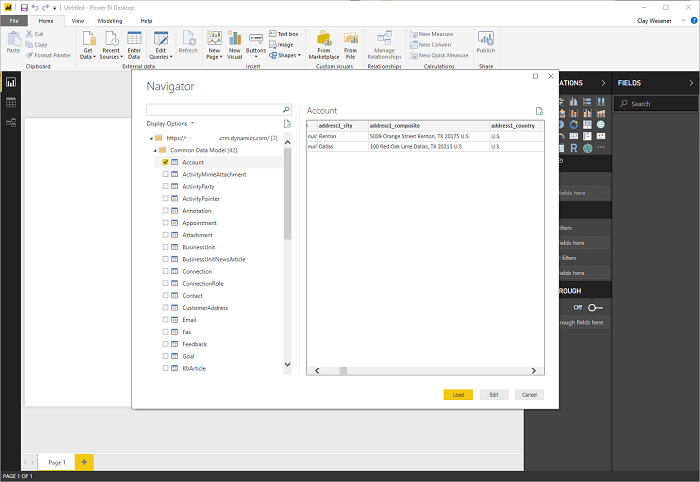 The CDS for Apps Power BI connector allows you to connect directly to your entities and build compelling reports and dashboards and share them with users on Power BI online and mobile apps. Common Data Service for Apps already allows you to connect to your data from Canvas and Model Driven Apps, Dynamics 365 Applications and through our Pro Developer SDK – with the release of this connector you can now report across all of your data within CDS for Apps, regardless of its original source or the app it's being used in, providing a consistent reporting tool for app builders, and end users. Power BI also enables you to mash up multiple data sources in a single chart, table or report allowing you to combine other data not stored within CDS for Apps in a single report. To get started building a report you'll need the latest version of Power BI Desktop (Download here) and a PowerApps environment with the latest version of the Common Data Service. You can see a detailed step by step of how to connect and create a report in our online documentation here. 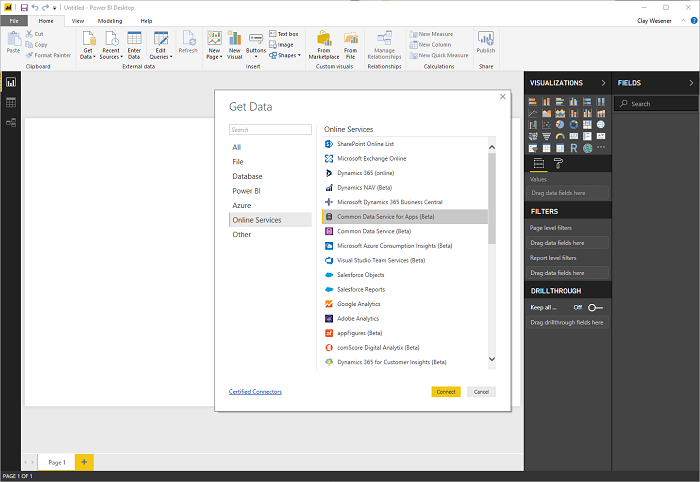 Using Power BI Desktop, you can now connect to your data using the Common Data Service for Apps (Beta) connector, under the Online Services section of Get Data. After you click connect you'll need to provide the Environment URL for your CDS for Apps environment in the format https://yourenvironmentid.crm#.dynamics.com/ you can read about how to find it here. If it's your first time connecting, you'll need to log in using the same credentials you use to connect to PowerApps. After connecting, you'll see a list of entities from your environment. The Navigator will show all your entities, grouped into Common Data Model, Custom and System entities. You can preview entities directly in the navigator and then select one or more by ticking the checkbox next to the entity and clicking Load. Once your entities are loaded, you're ready to start building your report, uploading to Power BI and sharing with other users. Once you've uploaded it to Power BI you can also configure the refresh schedule to determine how often and at what times you'd like your data to be refreshed in your report. We had previously announced a Private Preview for a Power BI connector that was only available to specific regions and participants – the new connector has been released as a Beta connector that does not require you to join any previews or have specific region requirements outside of general CDS for Apps availability. The new CDS for Apps connector is only available on updated environments which include the Spring Update, you can read more about it here. You need to be using Power BI Desktop (May Update) at minimum to see the CDS for Apps connector. Customers using Dynamics 365 applications which have been upgraded to V9.x can also use the new connector to create Power BI reports using the same steps outlined above. You can still continue to use the Dynamics 365 Online connector, but the new connector has improved performance and better handling of option sets. As always, you can discuss any features or post questions in the CDS for Apps community forum here.